We’re rounding the end of winter and we have some exciting updates about what’s been happening here in the continued evolution of ICC as well as some buzz with our extended graduate community that we’d love to share with you. You’ve probably heard by now. We’ve certainly not been quiet about it. I mean, how could we be!? A gathering of 30 amazing Integral Master Coaches™, sharing their unique perspectives on building resilience, pursuing initiatives of deep impact and responding and evolving in this crazy world we’re in! Resilience + Reach runs from Feb 25-29, 2016 and if you haven’t yet registered to gain free access to the 30 panels and interviews airing over this time, click here to reserve your spot now! Creating this summit has been an incredible labour of love. Behind the scenes has been hours upon hours of connecting as a community to bring this content forward. The connections and nourishment from gathering together deeply diving into topics of deep relevance for the times we find ourselves in has been profoundly energizing and marks just the beginning of the ways we intend to bring our graduate community together and create greater visibility for Integral Coaches™ globally. We’ve had an incredible launch of our first online course: The Spirit of Practice - Online, with over 60 Integral Professional and Integral Master Coaches™ enrolled and having an incredible journey. The feedback has been more than encouraging. This course has been deeply intimate and brought richness, insight and profound shifts for all of us in the field of practice, for participants and for Chela and Kevin, our course teachers! While we’re not quite ready to reveal the next offering in our Ecosystem, we’re in the kitchen cooking up something that we’re pretty jazzed about and we think will be meeting what so many graduates have been asking for. Stay tuned…and meanwhile, join us in our latest Ecosystem Offering, the Resilience and Reach Summit. We set ourselves a Big Hairy Audacious Goal: to coach 100 leaders in NGOs who are working in some way to address this crisis, thereby impacting the lives of thousands of refugees. 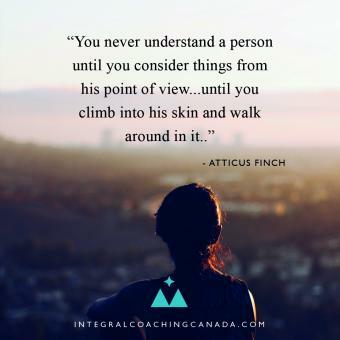 57 Integral Master Coaches™ offered one or two pro-bono coaching programs of 10-12 conversations, practicing the Integral Coaching® methodology. This was the inspiration for our brand name. Like Henry Heinz, we think 57 is a lucky number. We are already working with a large NGO, CARE International, and several leaders from CARE are now in the process of connecting with our coaches. We want to make sure that you have a chance to jump on board and help us reach our goal and more importantly meet the growing demand. If you are an Integral Mater Coach™ and want to join us, visit https://www.facebook.com/groups/Ic100volunteers/ or send an email to steerco@57coaches.org. We look forward to matching you up with leaders who are making a significant impact in one of the biggest humanitarian crises of our time. We’ve resurrected the blog on the ICC website! For many years, Joanne brought us gorgeous pieces of writing. As she dove deep with Natalie Goldberg and then stepped more fully into the role of assisting Natalie with writing workshops and intensives, she took a break from the ICC blog to focus on her personal writing. Joanne’s blogs are all still on the ICC website though, so if you haven’t read them (or if you haven’t read them lately), go check them out. Meanwhile, we’ve now resurrected the ICC blog and celebrated with our first New Years post, written by Chela Davison called The Duality of Full Engagement. This space will be the home to new articles and posts as well as host to our quarterly newsletters and other updates or announcements. Maybe we’ll even get Joanne to write a few! She’s certainly in the background bringing her valuable ideas, input and editing to the table. Since our last newsletter went out, our Australia ACM kicked off with an amazing group of students and Laura recently jumped on a group video call to welcome them into the fold. Exciting times around here, feeling our work continuing to ripple outward. Our team is so grateful to be working with incredibly body of student body. And here in our founding back yard, our Ottawa ACM just launched with Susan Loree stepping into the classroom with Steve Beckett and yet another group of incredible students eager to be of deep service.